Hong Kong International Airport (IATA: HKG, ICAO: VHHH) is the main airport in Hong Kong. 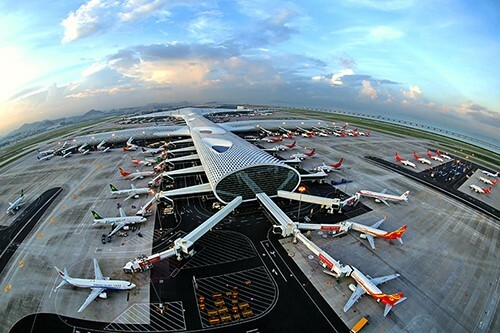 As a modern international airport integrated with ocean, land and air transportation in China, Shenzhen Baoan International Airport is the first international airport with transit transportation mode in China. The airport is well served by public transport: Metro, Shuttle, Buses and Taxi. Bus stops and taxi rank are located just outside/in front of the main airport terminal building. The metro station is across the road (50m) from this same building. 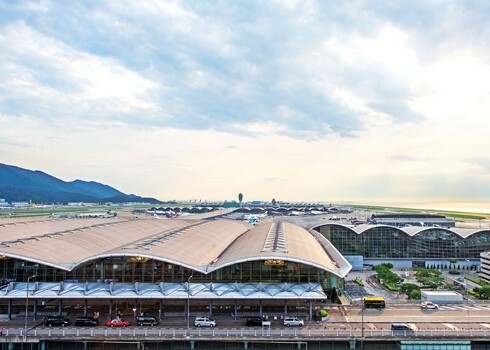 A wide variety of public transport services operate to and from Hong Kong International Airport. Discover the options below to determine which service best suits your needs. Travel comfortably between the airport and Central in just 24 minutes on the Airport Express. Trains depart at 10-minute intervals from 05:54 to 23:28 and approximately 12-minute intervals from 23:28 to 00:48 daily. For a detailed schedule of the Airport Express, please click here. Taxis offer a door to door service to and from Hong Kong International Airport. Arriving passengers can catch a taxi at the Taxi Station, located near the left-hand ramp outside the Arrivals Hall. Urban taxis (red) operate in most areas in Hong Kong (except partial of Tung Chung Road and roads in south Lantau). New Territories taxis (green) mainly operate in the north-eastern part (i.e. north of Sha Tin) and north-western part (i.e. north of Tsuen Wan) of the New Territories. 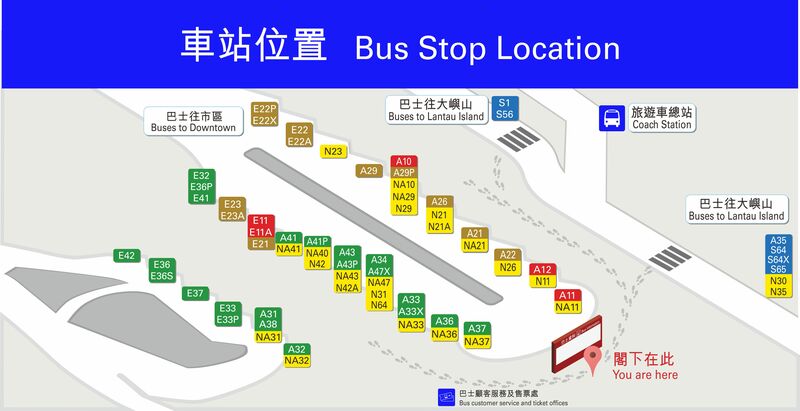 Lantau taxis (blue) operate only on Lantau Island and Chek Lap Kok. A wide variety of public transport services operate to and from Shenzhen Baoan International Airport. Discover the options below to determine which service best suits your needs. Hualian Mansion Shenzhen Airport 5:30 21:30 20 Travel time is about 35 minutes,with no stops halfway.One can take the bus 2 hours before the departure time of his/her flight. Shenzhen Airport Hualian Mansion 7:30 Till no flights 20 The destination of the bus is Qiaoshe City Terminal（West square of railway station ）。via Guangzhou-Shenzhen expressway,the station of Shenzhenair Mansion,and the station of Investment Building,and the station of Hualian Mansion. From Airport station, via Airport North station, Fuyong station, Qiaotou station, Tangwei station, Ma’an Hill station, Shajing station, Houting station, Songgang station, finally arrive at Bitou station. From the Airport station, via Bihaiwan station, Ban’an station, Qianhaiwan station, Nanshan station, Hongshuwan South station, Chegongmiao station, finally arrive at Futian station. Ticket price: RMB2 to RMB10 for Economical carriages; RMB 6 to RMB30 for Business carriages . Self-check in Service: self-check in service is provided at Futian station, Chegongmiao station, Houhai station, Qianhaiwan stationfor most Airlines’ domestic flights originally departing from Shenzhen Bao’an Airport, except Spring Airlines, Tibet Airlines. Operation time: From Hourui station to Terminal 3 is 06:30-23:30; From Terminal 3 to Hourui station is 06:30-23:30; Trains run every 20 minutes and it takes 10 minutes to arrive at the final destination, the fare is RMB 2. Remarks: the above information is for reference only. Please refer to the date of metor operator. We provide the citizens with red and green taxi service and we have set 9 red and 4 green pick-up seats at the taxi station in the eastern side of the 2nd floor of Ground Transportation Center (GTC) so that all the passengers can take taxi there. The taxis in Shenzhen are divided into green, red and electric taxis; among them, the red and electric taxis can be operated within the whole city while the green ones can only be operated out of the former special district. 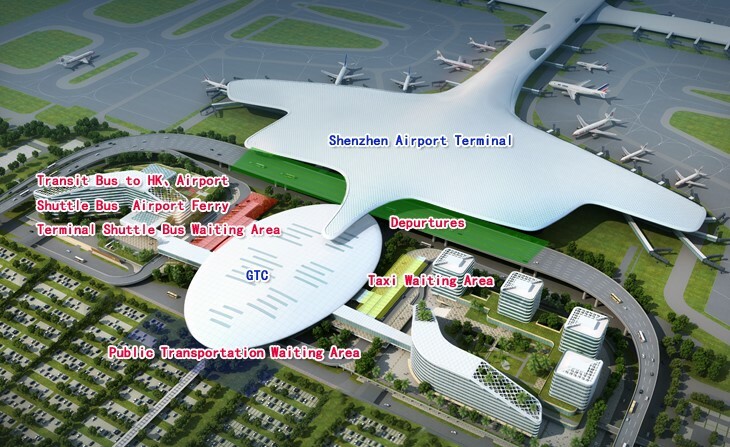 ● Shenzhen Airport: 25kms, 40 minutes.